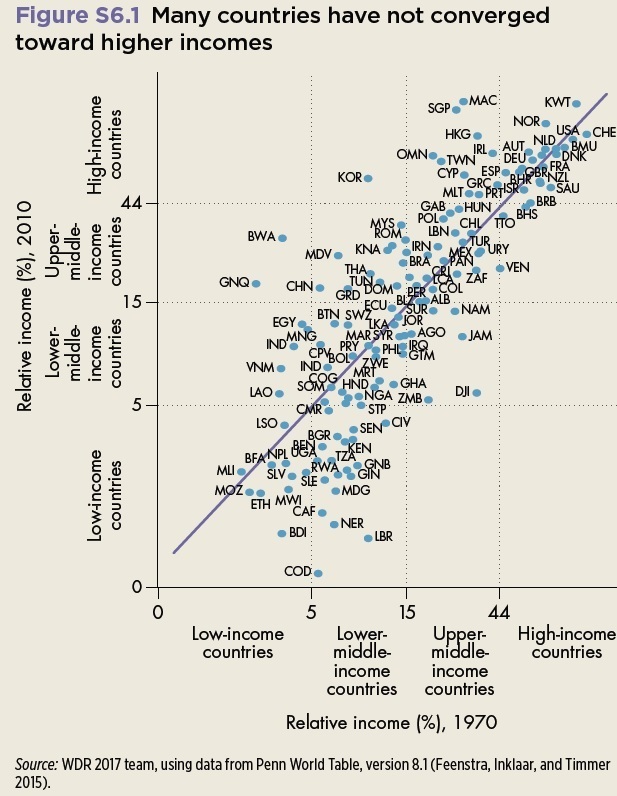 The "middle-income trap" is an argument that when countries have emerged from dire poverty to middle-income status, they can become stuck at that point, and stop making progress toward higher income levels. The World Development Report 2017 notes: "Contrary to what many growth theories predict, there is no tendency for low- and middle-income countries to converge toward high-income countries." The overall theme of this year's WDR is "Governance and the Law," and as usual, the report offers a wealth of examples and insights. Here, I'll just focus on the arguments about the middle-income trap, where the report illustrates its underlying theme by arguing that "the difficulty many middle-income countries have in sustaining growth can be explained by power imbalances that prevent the institutional transitions necessary for growth in productivity." This figure illustrates the patterns of transition for economies between low-income, middle-income, and high-income status. On the horizontal axis, countries are plotted by their per capita income level in 1970; on the vertical axis, by their per capita income level in 2010. To get a sense of how the graph works, look at the category of "lower-middle income" countries on the horizontal axis, with per capita GDP between 5 and 15% of the world leaders. Now run your eye up, and see how those countries are faring by 2010. A substantial share of them have fallen into the "low-income" category, although most remain in the same "lower middle" category as before. Only one of thee lower-middle countries from 1970, Korea, had emerged into the high-income category after 40 years. Similarly, if you start by looking at low-income countries in 1970, only two of them had risen as high as "upper middle income" by 2010: Equatorial Guinea (GNQ) and Botswana (BWA), which is a prosperity largely founded on oil and diamonds, respectively. "The creation of these institutions may be stymied by vested interests. Creative destruction and competition create losers—and in particular may create losers of currently powerful business and political elites.This is a more politically challenging problem than spurring productivity growth through the adoption of foreign technologies, which tends to favor economic incumbents. These political challenges may be particularly great in middle-income countries because actors that gained during the transition from low to middle income may now be powerful enough to block changes that threaten their position. In this sense, the challenges that middle-income countries face go beyond policy choice to the challenge of power imbalances. ... Understanding the policy arena in which elites bargain is essential for explaining the political economy traps faced by middle-income countries. level playing field for firms imply a need for accountable institutions. At upper-middle-income levels, legislative, judicial, media, and civil society checks become increasingly important." The difficulties in moving toward types of governance that can offer a foundation for both representation and growth is an ongoing theme throughout the report. 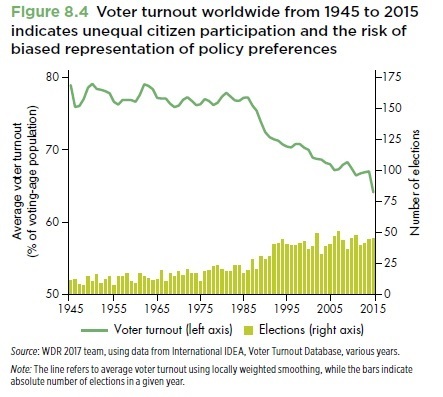 As another example, here are some facts about elections worldwide that raised my eyebrows. 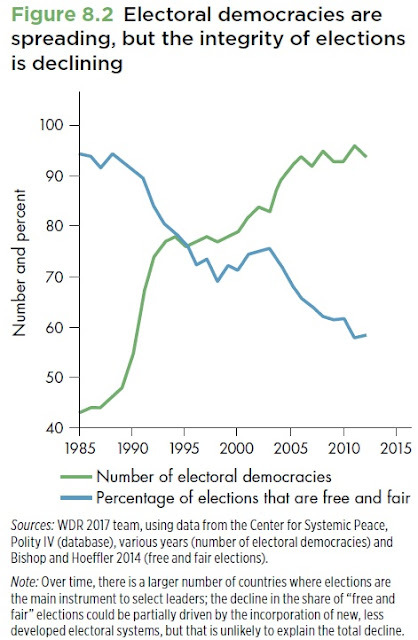 The share of countries holding elections is steadily rising, but the the share of elections rates as "free and fair" is steadily falling. 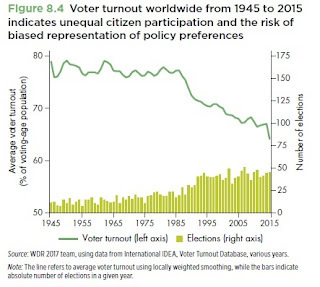 The number of elections is steadily rising (as shown by the bars) but voter turnout worldwide in those elections has been steadily falling. "Evidence from the last decade, however, suggests that the global trend may be a shrinking civic space (figure 8.10). 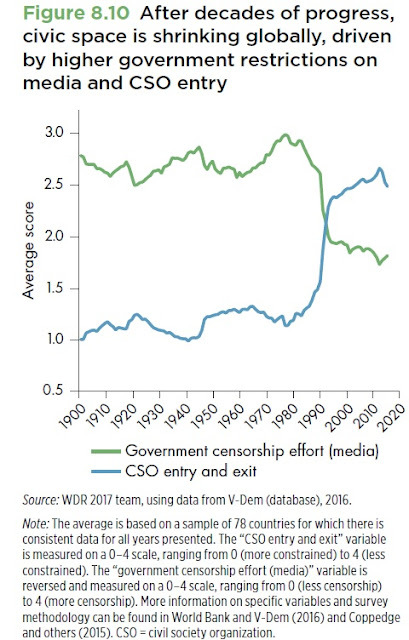 Many governments are changing the institutional environment in which citizens engage, establishing legal barriers to restrict the functioning of media and civic society organizations, and reducing their autonomy from the state. For example, in the case of media, governments may award broadcast frequencies on the basis of political motivations, withdraw financial support of media organizations and activities, or enforce complex registration requirements that raise barriers to entry into a government-controlled media market. 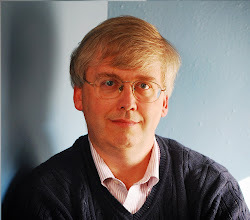 In the case of nongovernmental organizations (NGOs), governments might resort to legal measures to restrict public and private financing or pass stricter laws that restrain associational rights ..."
In short, economic growth and development isn't just about pulling the right economic policy levers--government budgets, monetary policy, investment in education, foreign aid, and the like. It's also about the extent to which economic forces have flexibility to function within the political and legal institutions of that society.